I have always loved when I see handwork suggested as part of a homeschool curriculum. Handwork is a word used to describe a wide range of activities that children and adults can do with their hands to create something. Knitting, crocheting, beading, and sewing are all examples of handwork. I love that handwork develops a child’s fine motor skills, reasoning, and logic skills, and lets the child create something to be proud of beyond block towers and drawings. The problem I have with handwork, as suggested in most homeschool literature, is that it focuses on knitting or crocheting, both of which can be nearly impossible to teach your child if you don’t do them yourself. And even if you can do them, many young children need a simpler starting point which requires less coordination and focus. You can have the joy of handwork, without all that stress. Let me give you some ideas of other ways to do handwork with your children. For the youngest children, I recommend stringing beads as a first handwork experience. Stringing pony beads on a pipe cleaner is an easy way to make a child-sized bracelet. And the stiffness of the pipe cleaner makes it much easier to work with than string. Simply turn up one end, or hold it for the child, while the beads go on, and twist the ends together to complete. Beads come in all kinds of shapes and colors, making this easy to modify to your child’s tastes, boy or girl. 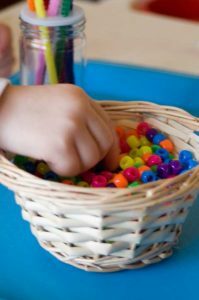 You can gradually make the task more challenging by changing beads and string. Start with thicker cords and laces with big beads. As your child progresses, you can move to thinner strings and smaller beads. Handwork should be enjoyable. So try to let the project be just challenging enough to be interesting but not so hard it results in frustration. Many children also enjoy working with yarn, even if they aren’t ready to knit. My daughter enjoys taking a skein and working it into a ball. Simply take a bit of tissue and start wrapping the yarn around, one way then another to help the ball take shape, and then to keep its shape. I also teach my young children to finger knit. There are many different types of finger knitting. 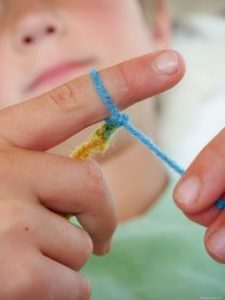 The simplest type requires making a slip knot and placing it over one finger. Then create another loop of yarn around the finger above the first loop, and move the bottom loop up off the finger. Repeat by looping the yarn, and pulling off the bottom loop. There are tons of great videos on YouTube demonstrating how to finger knit with 2, 3 and 4 fingers. The end result is a rope-like creation that can become a belt, necklace, scarf, or a wonderful rope for make-believe games. Finger knitting is the easiest way for most people to begin working with yarn because it doesn’t involve any tools other than your own fingers. Another great angle to start handwork from is sewing. Preschoolers can start with lacing cards, getting the motion of over and under that is necessary for sewing. Both of my daughters have made little purses as their first real sewing experience. We simply cut out a rectangle and folded it in half. The child sews up each side, leaving the top open, and then we sewed on a length of ribbon, attaching one end at each sewn upside. This simple pocket on a string is easiest to make out of felt so it won’t ravel. For the first project, I like to hold the fabric while the child sews. When the child is ready, she or he takes over holding it. 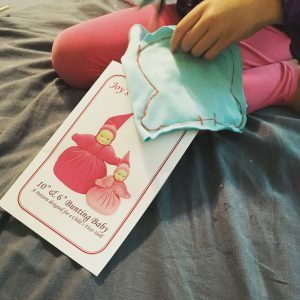 I like to start with very simple easy projects, like the pocket, or tiny pillows and let the child set the pace for tackling harder projects.